I have now made over 40 voyages on Queen Mary 2. In addition to being the best way to travel between Europe and America, I like Queen Mary 2 because each voyage is different. Here, the weather played a big role in distinguishing the two crossings. On the eastbound voyage, the seas were calm and the sun shined every day. It was like sailing the Caribbean. On the westbound voyage, a severe storm covered most of the Atlantic. The weather did not make one crossing bad and the other good. Rather, it served to create a different atmosphere. On the eastbound voyage, people went outside, the atmosphere was relaxed. On the westbound, there was a sense of excitement and adventure, especially when QM2 went to the aid of a distressed yachtsman (see separate feature). The sea conditions negatively affected some of the passengers on the westbound crossing. But QM2's seakeeping qualities are such that most of those affected were only affected on one evening. The majority of passengers were not affected at all. Stopping in Halifax also served to distinguish the two voyages. Halifax is the birthplace of Cunard Line's founder Samuel Cunard and to honor this tradition Cunard decided to add the city to QM2's itinerary on some crossings. It is a nice, clean city with a number of interesting places to see. We arrived on a bright, sunny day when Halifax was at its best. Although QM2 is an ocean liner, not a cruise ship, she does cruises quite well. And, in Halifax, she was in cruise mode. Some passengers went on ship-sponsored shore excursions. Independent passengers went out and came back to the ship during the course of the day. It was no different than when QM2 stops in Halifax on one of her Canada and New England cruises. ​Another reason that I have sailed so often on QM2 is because there is so much to do onboard. QM2 was designed for the Atlantic and so sea days are her specialty. 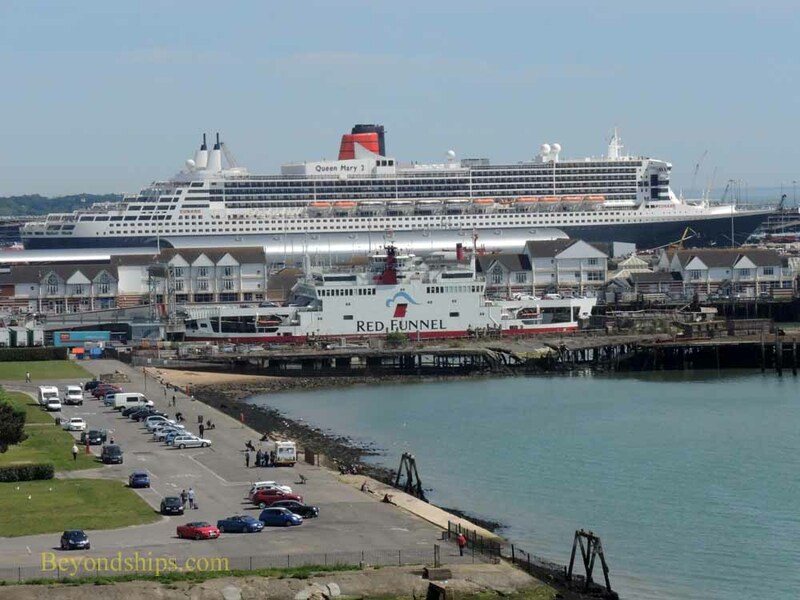 As a result, sea days on QM2 are different than sea days on most other lines. There always seem to be hidden gems waiting to be discovered on QM2. 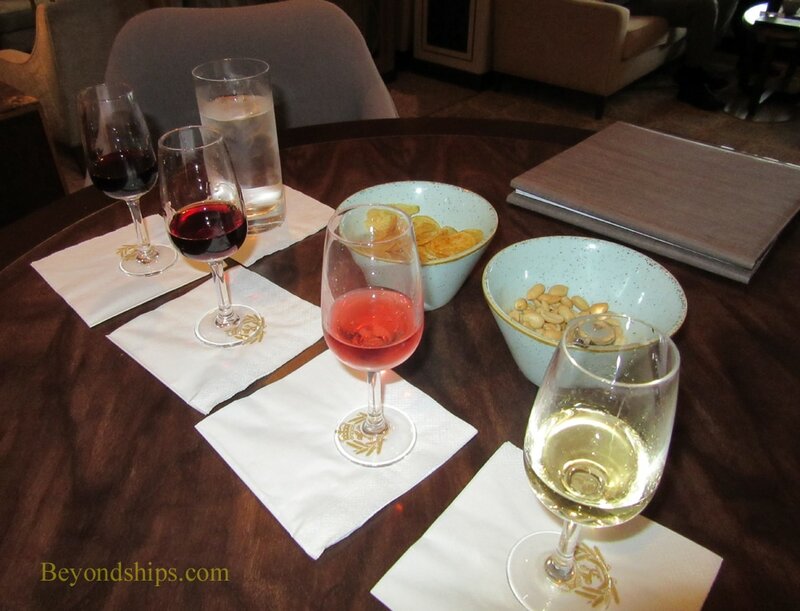 For example, on the westbound voyage, a friend alerted me to the port and sherry tasting flights in the Carinthia Lounge. Starting as low as ten dollars for a four glass flight, these tastings allow you to sample different types of port or sherry from different houses. In addition, you receive a good quantity of port or sherry in each flight. Thus, it is good value for money. Port and sherry are fortified wines i.e., distilled alcohol has been added. I believe that this addition originally was made in order to preserve wine that was being shipped over long distances but over time the public developed a taste for fortified wine. In any event, beware that it is a powerful drink. The port and sherry tastings are available in the evening in the Carinthia Lounge. There is live music - - usually a harpist or a string quartet. The atmosphere is very civilized. The Carinthia Lounge is also used by QM2's resident troupe from the Royal Academy of Dramatic Arts (RADA) to present various programs. When I first sailed on QM2, the role of the RADA troupe was to conduct acting lessons and to present plays in the main theater. ​Over the years, their role has grown so that now they give poetry readings, tell bedtime and ghost stories and do a program based upon Cunard's tradition and history. These additional programs are the ones that take place in the Carinthia Lounge usually in the late evening. Once again, it is quite civilized and so popular that it is often hard to find a seat. Perhaps nothing is as civilized on QM2 as afternoon tea. 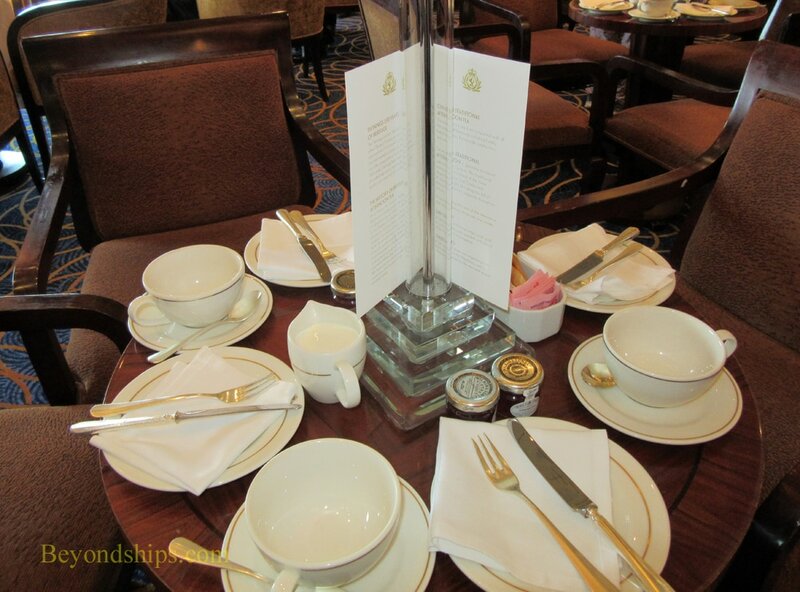 Tea can be had in a number of locations around the ship but the classic experience is in the Queens Room ballroom. White gloved waiters serve sandwiches, scones and cakes along with a choice of teas. Live music is performed on the dance floor. 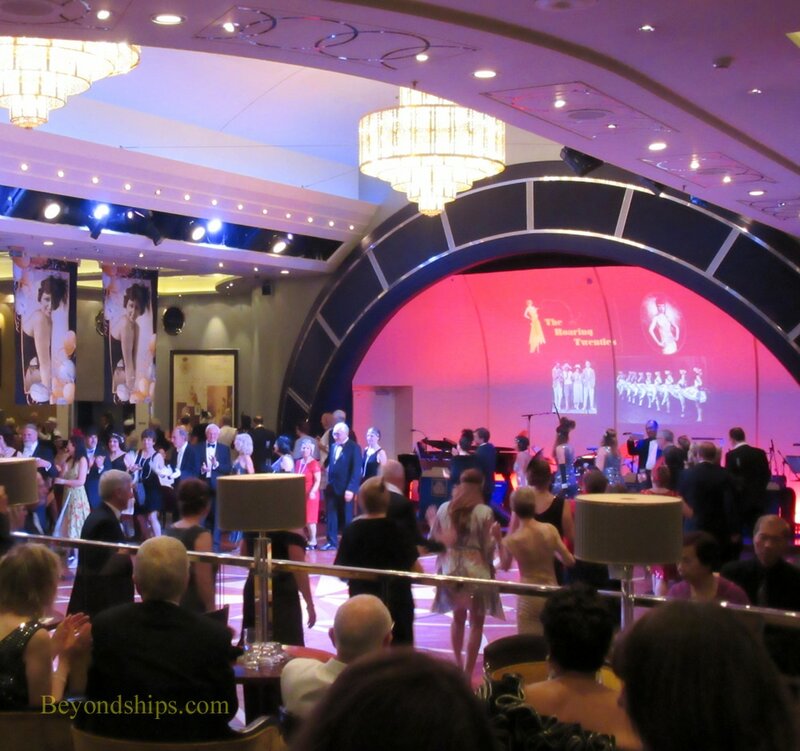 Indeed, on each transatlantic voyage, there is a tea dance. Afternoon tea conflicts with the 3:30 p.m. lecture in Illuminations, the ship's planetarium/cinema/lecture hall. Queen Mary 2 consistently has the best lectures that I have encountered at sea. Normally, there are five lecturers on each crossing including at least one person who is well-known in the UK or the United States. Topics on these two voyages included the theater, film, music, naval history, television, art, spies, crime, and balloon racing. All of the lectures were well-attended. The programming also included classical music recitals and watercolor lessons as well as trivia contests and other shipboard standards. The art gallery and the spa also conducted programs. Evening entertainment included shows performed by the Royal Cunard Singers and Dancers as well as shows by guest performers. In addition, a series of balls were conducted in the Queens Room. These have become quite popular with the large dance floor full of people doing sequential dancing during the Black and White Ball. Similarly, quite a few passengers dressed in costume for The Roaring 20s Night. Of course, a large portion of each evening is spent dining. The Britannia Restaurant is a spectacular room reminiscent of the first class dining rooms of the ships of the Titanic era. Indeed, it is a more impressive room than the two Grills restaurants that are the dining rooms for the guests staying in the ship's suites. The service is unobtrusive, polite and efficient. It is done in the British style rather than the American style followed on most cruise ships. I always request to be seated at a large table. Meeting new people and conversation is a key part of the experience. On QM2, there is a mix of nationalities and backgrounds so you are presented with perspectives that are outside your daily orbit. Most people are surprisingly open when at sea. Food, of course, is a matter of personal taste. I tend to prefer my food spicier than you usually find at sea but the food on QM2 had sufficient personality to make it enjoyable. I also thought there was quite a lot of variety on the menus. I was disappointed that there was only one night where a souffle was offered. Souffles were once a QM2 tradition and remain my favorite QM2 dessert. I had lunch at the Verandah specialty restaurant twice. The atmosphere, which harkens back to the original Queen Mary, is quite serene. Service was very good. The food is tasty but less imaginative than when it was the Todd English Restaurant. The King's Court buffet restaurant was remodeled last year and is now easier to navigate. I was impressed by the variety of food offered including items such as lobster tails and artisan cheeses. However, I prefer to be waited on. ​Speaking of changes, the ship's champagne bar now features Laurent Perrier champagne rather than the Verve Clicquot champagne that the bar has featured before. I was apprehensive about this switch because I like Verve Clicquot very much and heretofore I was less familiar with Laurent Perrier. However, I was pleased to find that Laurent Perrier is also excellent. I suppose that is why they have a royal warrant. Undoubtedly due to the variety and quality of the cruise experience, QM2 is becoming a destination in itself. On the westbound voyage, about a third of the passengers were going round trip i.e., returning to the UK on the next crossing. Since the ship was leaving for the UK the afternoon it arrived in the United States, there passengers would have only a few hours in New York. Clearly, these people had come to be on QM2. This was not just some quirk peculiar to the British. On the westbound voyage that I was on, there were a large number of passengers who had sailed from New York on the prior eastbound voyage. They only had a few hours to venture out to Stonehenge or Windsor before sailing. Central London would have been impractical to visit in the time available. Once again, being on QM2 was the clear attraction. Above: A port wine flight in the Carinthia Lounge. Below: A table set for afternoon tea in the Queens Room.. Above: The Roaring 20s night ball in the Queens Room. 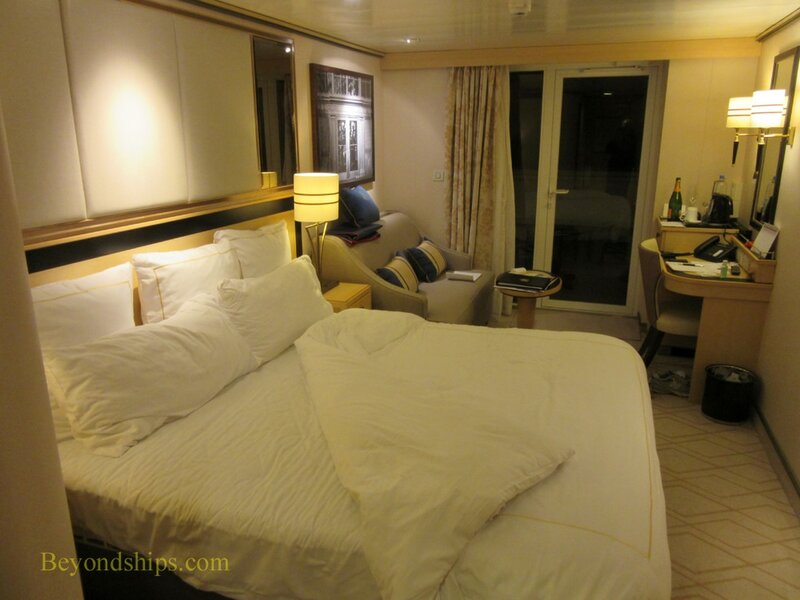 ​Below: A sheltered balcony stateroom. 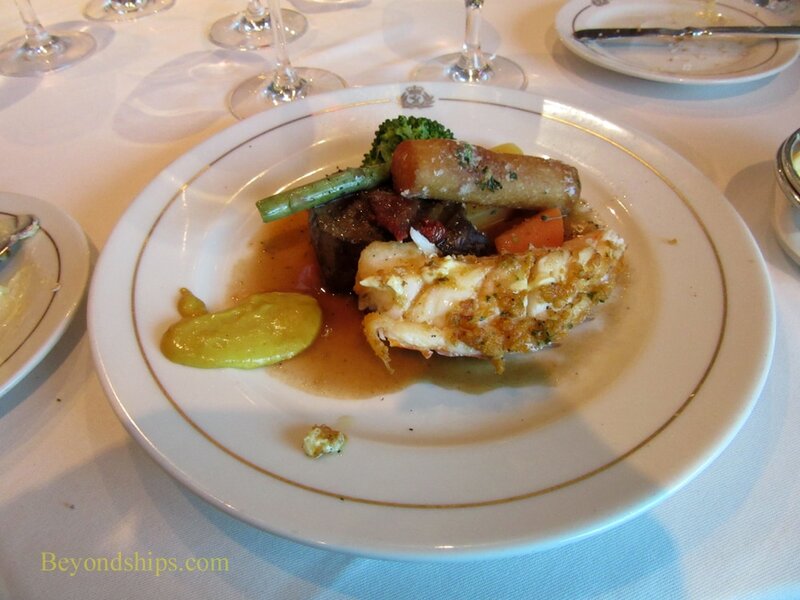 Above; A "surf and turf" (grilled beef mignon and buttered lobster tail) dinner in the Britannia Restaurant. 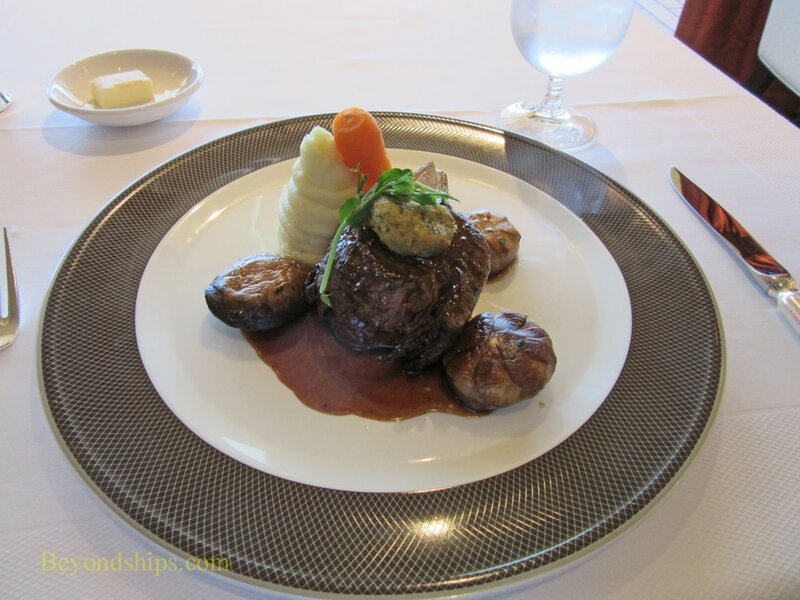 ​Below: Beef Bourguignon lunch at the Verandah Restaurant.